Make Your Prospect's Dream Suddenly Come True And Win Them Over! On a daily basis, we all have moments in which we think of ways that could make our lives just a little bit easier. This moment could be ways that could save us time. This moment could be ways that make us more money. Or, this moment could be ways that could save us money. In conversations with your prospect, you may have heard these moments from time to time without ever realizing their importance. Many times, these moments are references to their personal life and have nothing to do with business. Once you learn how to recognize these moments as opportunities you will without question win their business. Go to your local bookstore and purchase a Travel Book of the destination that your prospect is visiting. Then, you can personally deliver this book as a courtesy of (Your company name here) to their office. Do some research online to locate a list of top companies that may directly compete with your prospect�s business, print this list out and then personally deliver this list as a courtesy of (Your company here) to their office. Your prospect might be able to contact executives at these companies to entice them to join their company! While these STANDOUT responses may seem novel in nature, the above examples are small actions that you can take to win your prospect�s business. These examples help make your prospect�s personal and work life just a little bit easier. These actions help your prospect to remember you the next time that you call. These actions help to separate you from others who are contacting your prospect. The more you consciously become aware of these moments as opportunities and act on them, the more likely you will BE A STANDOUT and make their dreams come true and win them over! Copyright 2007 MR. 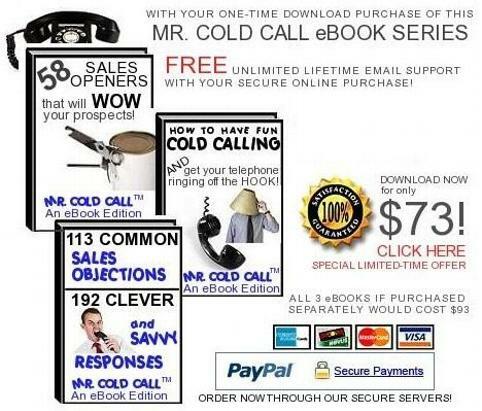 COLD CALL SEMINARS - All rights reserved.